Landscape Discount offers a variety of different gravel grid solutions which provide stability, gravel migration control and protection against rutting for gravel surfaces such as parking lots and gravel driveways. Gravel grids are easy to install and provide the stability of pavement without the upkeep or runoff issues associated with a cement surface. We offer a number of different solutions for stabilizing and controlling gravel each with a distinctly different design and ideal application. The rolled gravel pavers are perfect for large projects where the surface is angular in shape and where the material can be installed in long strips. For applications which are circular, curved or small in area, the panel gravel pavers are ideal and widely adaptable. For installations where the most economical solution is required the GeoCell product is a perfect fit. All of the gravel grid products can be cut to fit around obstacles and all three options are designed for both vehicular and pedestrian traffic. EZ roll gravel pavers are a perfect solution for large gravel areas such as parking lots and roads. Installation is simple and the material is available in a variety of different colors to match the desired gravel color. EZ Roll Gravel Pavers can lessen erosion at the same time it aid to keep the functionality and up kept look of a gravel road. In addition, the gravel pavers lessen the water run-off of surface and provide a sustainable and attractive choice to the traditional asphalt or concrete. The major strength of the EZ Roll pavers is the installation process. Once a gravel sub-base is prepared and compacted the material is designed to be simply rolled out into place. Once rolled out the material is staked into place and the cells are filled with gravel. Once the cells are filled with gravel the material is ready for vehicular or pedestrian traffic. In addition to it's easy installation the EZ Roll material also provides protection agains material bubbling due to gravel being lodged beneath the cells. The EZ Roll cells are fused to a piece of geomemberaine which prevents gravel from being forced underneath. The geomembraine also helps to prohibit weeds or other plants from growing up through the gravel cells. BodPave 85 Porous is a modular permeable gravel grid solution for ground reinforcement where in a gravel surface is needed. It features a permeable paving grid that is manufactured from recycled HDPE. The gravel grids interlock along with each other to provide ground stabilization with the gravel fill contained as a substitute to concrete and asphalt surfaces. Some of the features of the BodPave 85 is it has some distinct design features that will improve resist lateral movement, enhances tractions and permits contraction and widening while proving a sturdy stabilized surface. The gravel grids open a cell structure permits high surface of water infiltration along with that is suitable for NPDES and LID guidelines for the control of source or any storm water management systems. BodPave 85 permeable paving gravel grids must be installed into a free draining, well prepared, firm and level sub-base. The Bodpave 85 pavers really excel in small gravel areas or curved driveways where a 150' rolled paver wouldn't be practical. The grass pavers have load-bearing capacity that can reach up to 367 tons / square yard providing a stable surface for most vehicular and pedestrian traffic. BodPave 85 is a reasonable and cost-effective answer wherein a permeable “green” porous is needed as well as in situations where gravel must be contained specifically in the conjunction with the guidelines of the NPDES and LID. When it comes to load support, TYPAR GeoCell GS is a great option. A confinement system that uses the permeability and strength of TYPAR Geotextiles to construct a 3D cellular confinement system. Produced from dark-gray bi-component fiber textile wherein the cell wall is permeable into the water, nutrients and air, enhancing the stability and the vegetative performance. The GeoCell GS system ships in a compacted panel form that widens into a honeycomb structure to the desired shape and on-site dimension. The lightweight and unique feature of this product as well as the flexible material matches to the surface variations to develop and enhance handiness of installation while preventing impact damage. Moreover, the cell transfer of GeoCell GS downward forces laterally, spreading out loads on the soil lying beneath. The system of the cellular confinement is the perfect solution for presenting stabilization to poor soil cases, lessening constructed depth profile and cost, securing roots and soil from compaction and offering site access for light, heavy and industrial vehicles. 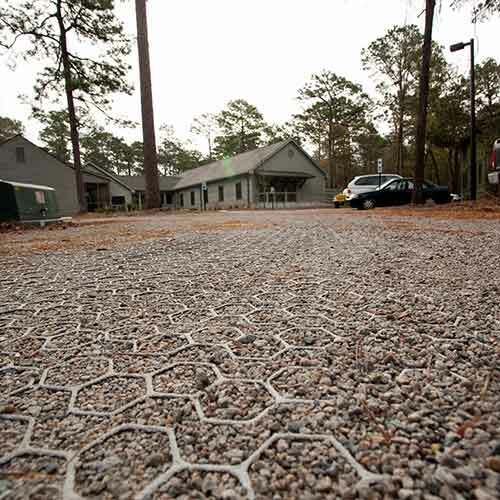 A geocell gravel grid will also help in preserving the atheistic look of a gravel drive or parking lot. In addition, the geocell will provide cost savings due to the reduced long term maintenance required for the gravel surface. 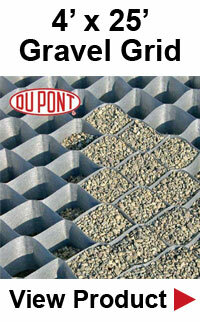 Do you need help specifying the correct gravel grid products for your project? Feel free to give us a call to discuss your project at (800) 524-4161.